In fact, Zacharias was never on the faculty in any capacity at Oxford University. He spent some time in the city of Oxford with an honorary position at Wycliffe Hall, a ministry preparation school which has an affiliation with Oxford but his statement here is simply false. For those who followed the scandal surrounding Zacharias’ credentials back in December 2017, this will seem like old news. However, what was true then is still true – in the public statements from his ministry, Zacharias never addressed his false claims about credentials from Oxford and Cambridge. He has not acknowledged them, even though some of them still persist in his publications and speeches such as this video. Zacharias’ false claims about his credentials came under scrutiny through the persistent work of attorney Steve Baughman. Christianity Today briefly took up of credential inflation via an interview with John Stackhouse, an apologist and professor at Crandall University in New Brunswick, Canada. Stackhouse explained that in North America, colleges and universities “refer to assistant and associate professors as ‘Professor,’ but at Oxford you have to have attained that final rank for that term to apply to you.” Those who have rank at less than full professor are given other titles. It isn’t a “dynamic equivalent” translation of a foreign educational situation for a lay American audience. It is a falsehood that serves only to exaggerate his intellectual authority. One just can’t make a remark like this as a mere error. It’s like saying “I’m an astronaut” or “I’m a senator.” If you understand the terms at all, you can’t use them unless you literally are an astronaut or senator. Compounding the problem is that Zacharias hasn’t personally addressed these issues. I asked Ravi Zacharias International Ministries for a comment on this video last night and did not hear from them today. Evidence does not provide basis for formal discipline under the C&MA policy. 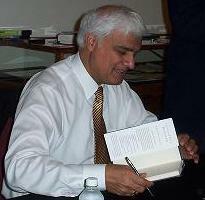 Ravi Zacharias has maintained his licensing credentials through The Christian and Missionary Alliance (C&MA) for 45 years. Along with all C&MA licensed workers, he is subject to the Uniform Policy on Discipline, Restoration, and Appeal. Recently Mr. Zacharias has been accused of exaggerating his academic credentials. Mr. Zacharias and his employer, Ravi Zacharias International Ministries, have revised and clarified their communications to address these concerns. The C&MA has determined that there is no basis for formal discipline regarding this matter. Mr. Zacharias has also been accused of engaging in an immoral relationship with a woman through the use of electronic communications. The C&MA recently completed a thorough inquiry of these accusations, including interviews with those involved and a review of all available documentation and records. While it is not appropriate to publicly discuss the nuances of these allegations, the available evidence does not provide a basis for formal discipline under the C&MA policy. Questions may be directed to Peter Burgo, at communications@cmalliance.org. Immediately, I asked Mr. Burgo where Ravi Zacharias or his ministry addressed the false claims about Cambridge and/Oxford. There has been no reply as of time of publication. Although I don’t believe RZIM’s statement regarding Zacharias’ use of the title “Dr” was satisfactory, there was some kind of response. 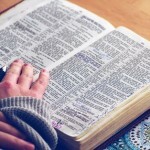 However, there has been no response from Ravi Zacharias about his claim that he was a “visiting scholar at Cambridge University.” Zacharias also incorrectly said he was an “official lecturer at Oxford University.” These claims were never admitted or addressed despite being made for many years. This vague paragraph does not take responsibility for the deceptive use of positions at Cambridge and Oxford not actually held by Ravi Zacharias. He did this for many years and these claims continue to be a part of his books without explicit correction. Likewise, the C&MA statement comes across as a cover up of the credentials misrepresentations of Ravi Zacharias. In fact, Ravi Zacharias and his ministry have not revised and clarified their communications to address the concerns. They spun some of the concerns but ignored others. Alas, that is what the C&MA has done as well. Because Ravi Zacharias doesn’t refer to himself today as a visiting scholar at Cambridge, the church apparently isn’t going to comment on the many years that he did it before it was revealed to be a false claim. According to the C&MA’s Uniform Policy on Discipline, Restoration, and Appeal, those who are investigated can face several disciplinary outcomes ranging from reprimand to expulsion. It is hard to understand how Ravi Zacharias escaped at least a reprimand for repeated misrepresentations of his credentials over the decades of his public work. Initially, it may appear that the C&MA exonerated Zacharias for his online relationship with a Canadian woman. However, I don’t know that it should be interpreted that way. Because the statement only refers to “available evidence,” the conclusion reached by the church is limited by what they could discover. In fact, both Zacharias and the woman are bound by a non-disclosure agreement. There is little now that anyone can discern based on the legal arrangement between the two parties. See correction below – Ravi Zacharias’ Ligonier bio has been changed to make it accurate. In a 2015 Church of England report evaluating ministry training at Wycliffe Hall, reviewers disclosed that the relationship between the Oxford University affiliate and Ravi Zacharias International Ministries had become a “cause of concern.” In 2006, Wycliffe Hall, a theological training center for the Church of England established the Oxford Centre for Christian Apologetics in cooperation with RZIM. However, Oxford University became concerned that the admissions to the centre were being confused with admissions to Oxford. WH began a relationship with Ravi Zacharias International Ministries in 2006, establishing OCCA, the Oxford Centre for Christian Apologetics. The relationship became a cause of concern to the university when admissions to the centre were not clearly differentiated from admissions to the university. Admissions procedures have now been clarified although some concerns remain for the university. For WH, the attraction of OCCA is important for recruitment to the Certificate in Theological Studies, particularly in relation to overseas students, whilst remaining clearly a separate entity. The independent students who had accessed the teaching of OCCA were very positive about it. A member of teaching staff is shared between WH and OCCA. 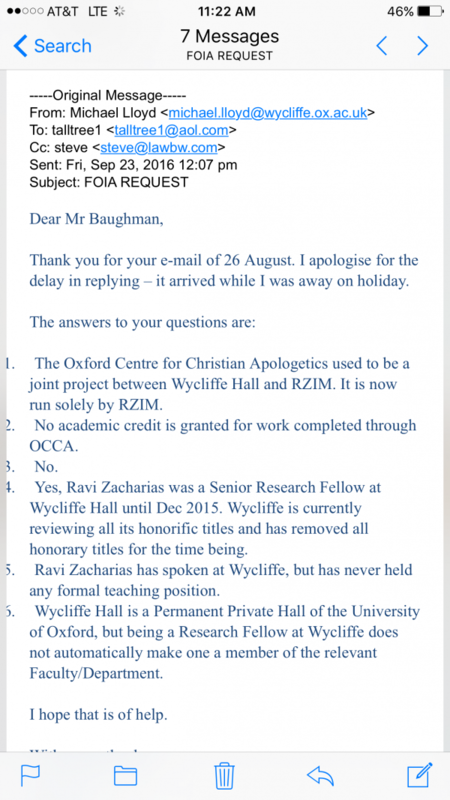 The concern disclosed in this report may be what led Wycliffe Hall to end Ravi Zacharias’ honorific position of Senior Research Lecturer in 2015 and suspended the use of such titles. 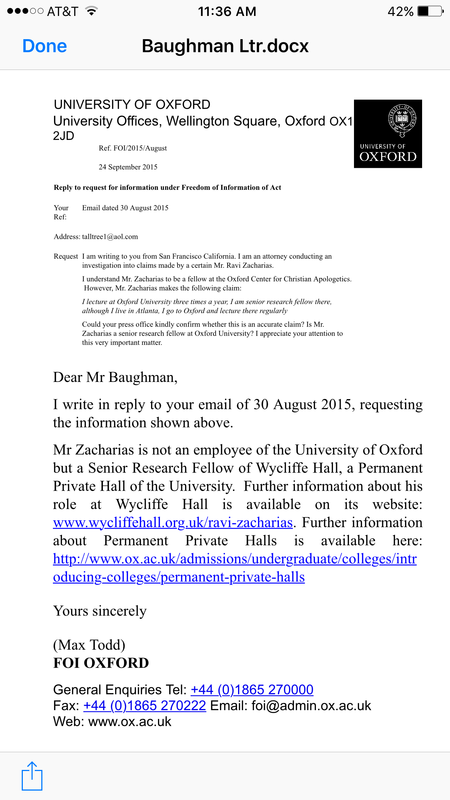 According to an email from Michael Lloyd at Wycliffe Hall to Steve Baughman, Wycliffe Hall took several actions pertinent to the Church of England report near the end of 2015. The organizations are separate. The current websites make this clear. According to this email from Wycliffe Hall, even at the time, it was deceptive to say that an honorific title at Wycliffe Hall meant one was a lecturer at Oxford University. 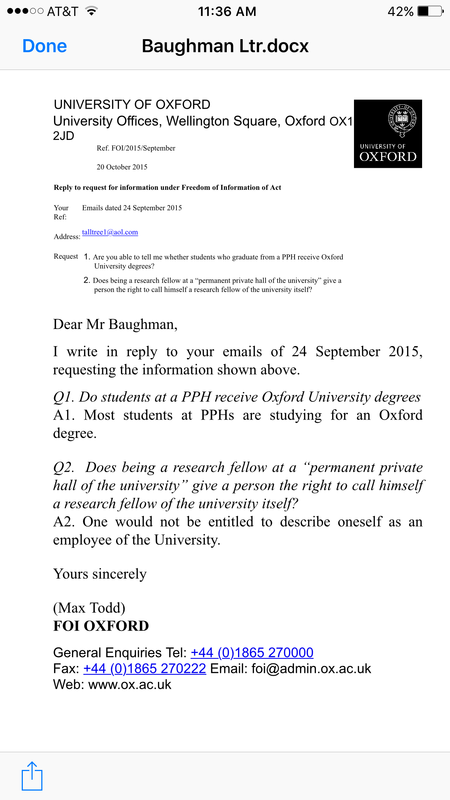 Senior Research Fellow at Oxford University? Currently, one could be forgiven for thinking there is still some connection between Ravi Zacharias and Oxford University. As I pointed out recently, a current Ravi Zacharias bio up on a website for the Ligonier Ministries West Coast conference to be held in June 2018 proclaims that Zacharias is currently a senior research lecturer at Wycliffe Hall, Oxford University. (UPDATE: As January 10, this bio has been changed to remove the reference to Oxford University). His current bios at Veritas Forum, BioLogos, The Stream, and elsewhere have this information. Our Oxford Centre for Christian Apologetics (OCCA) is now accredited with degree programs at Oxford University. He wrote in his autobiography that he is “an official lecturer at Oxford University,” “lecturing there once a year” and has said that in at least one media appearance. It is no wonder that officials at Oxford and the Church of England expressed concern that there might be confusion about the relationship between OCCA and Oxford. In RZIM’s December statement, there was no mention of the false claims about connections to Cambridge and Oxford. These were the most deceptive claims but these did not get any explanation. RZIM supporters share the burden of addressing these issues. Ravi Zacharias cannot claim to have addressed the controversy with integrity until he can address head on these issues and take steps to correct the numerous deceptive representations of his work for which his organization is responsible. John, what do you think with regards to character? So when someone does this and it is revealed that the information in their bio may be exaggerated or may be outright fabrication, is it okay to question their integrity overall? Well, when your whole job is to tell the truth as accurately, carefully, rigorously as possible, when what you’re really asking people to do by setting forth your credentials – which literally comes from the same word as creed or credo – why I should be believed, then you really take on a tremendous burden to speak very circumspectly. And if right out of the gate your credentials are suspect, then what are people supposed to do in the audience when he makes certain claims? Are they all supposed to hit their phones, or tablets and start checking everything you say because the stuff they can check isn’t quite true. Isn’t quite true. And I think as soon as we get into the it’s not quite true phase, I think you’re done. I just don’t think you can continue as an apologist if you’re not going to be scrupulous about telling the truth in a way that you can predict your audience will understand. Otherwise, you’re in the wrong game. The issue of credibility and trust is central to the entire problem. As a part of his talks, Ravi Zacharias makes fact claims. Some sound a little suspicious to me. Now that I know that some of his credentials claims are off, I am reluctant to fully trust much else. Stackhouse’s critique is devastating because he is a Christian apologist in his own right. Although the fans of Zacharias are loyal, I hope Christians continue to bring this to RZIM’s attention and ask for accountability and correction. 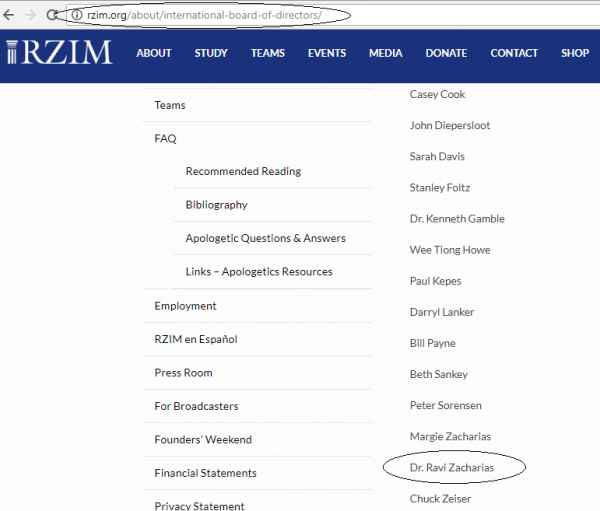 UPDATE: In the afternoon of December 6, RZIM removed the “Dr.” title from Ravi Zacharias name. To see it as it was earlier that day and before, click this link. If you make a public statement, make sure you are complying with it when you make it. Right now today, when you go to the International Board of Directors page of Ravi Zacharias’ webpage, here is what you will see. Then go to this page and this page to see more examples of how this year the ministry has contradicted the statement they released on Sunday. This is about what reality you believe. Reality: Ravi Zacharias and his ministry have improperly brandished the “Dr.” title for many years up to today on their own websites, have asked others to call him that, failed to correct others when it was used improperly. He also claimed honors and appointments he didn’t hold (e.g., “visiting scholar at Cambridge University”). Reality RZIM is pushing: Ravi is humble and would never brandish the “Dr.” title (as if he has no control over what his ministry does). We (RZIM) used to do it but don’t anymore and we can’t control when other people do it. Obviously, the ministry and Mr. Zacharias on Sunday weren’t doing what they claimed they had been doing all along. Ministry personnel from the top of the organization to those who create promotional material have referred to Zacharias as Dr. throughout the year up to the present. Those who have heard Zacharias speak at various churches have indicated that he is introduced as Dr. Zacharias repeatedly year after year. 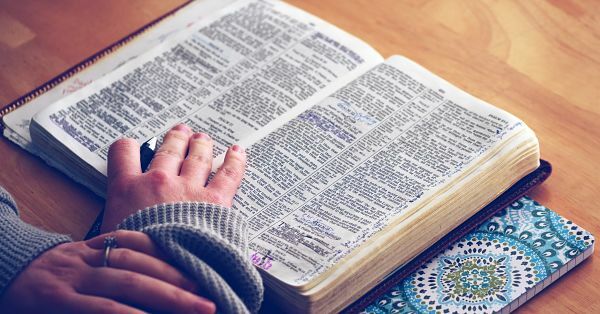 It would so refreshing for the ministry to simply admit that Ravi Zacharias’ credentials have been inflated for many years and that they are now committed to simply reporting the facts. 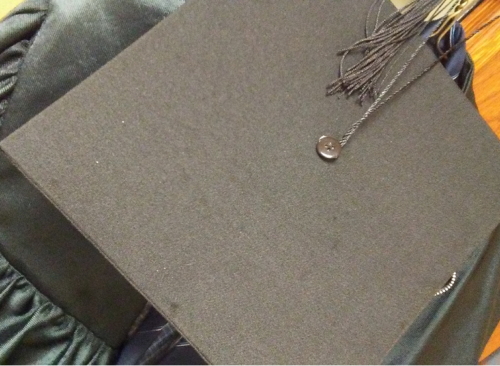 Prior posts on Ravi Zacharias’ credentials. Is Dr. Zacharias in the House? Was Ravi Zacharias a Visiting Scholar at Cambridge University? Earlier today, Ravi Zacharias issued statements regarding the allegations of sexting with a Canadian woman and misrepresenting his academic credentials. Apparently, he gave Christianity Today notice of the statements since they published an article about the issue around the time the statements appeared. Just last week I found numerous instance of his own websites referring to him as “Dr. Zacharias.” I have the screen caps of the websites to prove it. Here is just one from April 12, 2017 which I captured last week from the RZIM You Tube account. I intend to pull together more. Listen to the first few seconds of this video in April, 2017 at Temple University. Zacharias is introduced at this RZIM event as Dr. Zacharias. Here is one of his senior staff Vince Vitale calling him Dr. Ravi Zacharias in his own institute in March. Here is an ad put out by RZIM for his appearance at University of Michigan earlier this year. Watch to the end and you will see that this RZIM produced ad promoted Zacharias as Dr. Ravi Zacharias. How many more of these will it take to demonstrate that this statement from RZIM isn’t correct? For another one, click this link to see Zacharias’ complete bio from RZIM’s Academy referring to him as Dr. Zacharias taken 11/27/17. As of tonight, the RZIM Academy website has been scrubbed and revamped to cleanse it of all references to Dr. There is no misunderstanding. The organization has been busy covering up the evidence. Why can’t they just acknowledge that? You can see it on the web still at the Canadian website. If that is true, then why go to such lengths to cover up the changes? It is very hard to take any of this seriously when it is obvious that Zacharias and his organization have brandished the title Dr. and are now denying it. Actually, it appeared in numerous materials, not some, and no, it is not appropriate and acceptable. If it was, he wouldn’t be taking it down. This is simply not credible, given the number of times his own organization has used and continues to use the title Dr. with Zacharias. If it is Ravi’s custom to request that inviting parties not use “Dr.”, why can’t his own social media team get the memo? Here is a tweet from RZIM India’s Twitter account on November 19. There are many like it. Given the spin being used in the statement above, I don’t accept this statement at face value. My sources have explained that he was investigated but is not now under discipline. There is nothing in this statement about Zacharias’ claim to be a “visiting scholar at Cambridge University.” He clearly was not but didn’t address this false claim along with others in his bio. He simply removed all claims in the current bio. While I am not a target of the kind of material Zacharias puts out, I have become a skeptic of his ministry. I had hoped he would truly face the distortions and exaggerations of his credentials. He did not do so in a way that would lead me to trust his work.